I am searching for a novel I read in elementary school. As I started high school in 1993, I'm going to say I read it no earlier than then, and probably more like 1989 or so. This is what I remember. At the beginning of the story, a woman reporter is assigned to investigate rumors of odd apparitions appearing around the town they are in. The apparitions look like they come from ancient civilizations; I seem to remember one being compared to Genghis Khan. The woman somehow involves another man (perhaps also a reporter? I forget) who is helping her. They are driving their car on a mountain road near where several of these apparitions have appeared, and they end up seeing one of these apparitions for themselves and (I think) crashing their car or getting run off the road or something. Then a mysterious car appears, and its occupant invites them to the facility where they will explain everything. He claims to have cleared it with their editor/boss; they are to stay and observe the project. It will stay a secret until the project is over, then they will have had exclusive and up close access. It turns out that the facility was run by a group of scientists who had accidentally created a pocket universe. The thing is huge, I seem to remember that it filled a room, and there were catwalks that ran around it, I think? It was enclosed by powerful magnetic fields. Somehow the apparitions that had been been outside were leaking out of the universe, and the fields were supposed to contain it? If I remember the details right, I think there was talk of having created a miniature atom, or perhaps splitting an atom somehow, and this atom had evolved into an entire miniature universe. Eventually they had figured out that they could watch the universe evolve to learn things about our own universe. In the early days, the scientists had been training powerful microscopes onto the universe to be able to see civilizations growing. They had photographs of this, and as their equipment got better, the protagonists could see the progression of better and better pictures. Then someone had discovered that if you were looking into the microscopes just right, they could jump into the bodies of the aliens they were observing and experience what they were experiencing. At one point, the male reporter jumped into the body of an alien who was the first astronaut to leave his planet for the first time (he was like our Neil Armstrong). During later jumps into other aliens bodies, that astronaut's name would appear as the name of star ships and other important things. The woman reporter experiences being in the body of an important religious figure (also female). Through subsequent jumps, that religious figure's descendants claim to know what the original religious figure would have thought about developments in the world. Eventually the scientist inhabitants of the miniature universe realized their universe was winding down. The Earth scientists who had created the world knew this as well, and knew that their tiny counterparts were right. The plan was to let the universe wind down on its own accord; then the reporters would be free to write their story. The inhabitants of the miniature universe had other plans, though. They intended to build a generation ship that would attempt to fly beyond the confines of the miniature universe. The descendants of the religious leader counselled them to have faith and believe it would work. The Earth scientists were pretty sure they wouldn't be able to escape their artificial universe. Nonetheless, they also made sure their magnetic containment fields were strong enough to contain the ship should the mini's managed to escape somehow. As the mini's are flying toward the boundary, the woman reporter disables the containment field, and the generation ship pierces the bubble and begins growing. As it flies into our world, it is seen expanding, presumably growing proportionally to its proper size in our universe. It flies away. The woman reporter turns out to have been not only the female religious figure, but also many of her descendants. She had counselled them to attempt to escape, fully intending to shut off the containment field to give them a chance to continue living in our world. I might have some of the details wrong, but overall I'm pretty sure that most of this is right. At least, the story should be largely recognizable. I checked it out of my town's small public library when I was in elementary school (probably between 4th - 6th grade; 1988 - 1990ish), so it was almost definitely a paperback pulp novel, since that was what I preferred to read at that time. At this early point in my literary development, I was not yet paying attention to such esoteric things as "titles" and "authors." I have searched in vain for this story for a good 20 years. I'd dearly love to read it again and see how my impressions of the story have stood up over time. If anyone can help me with the title and author, I will be forever grateful. 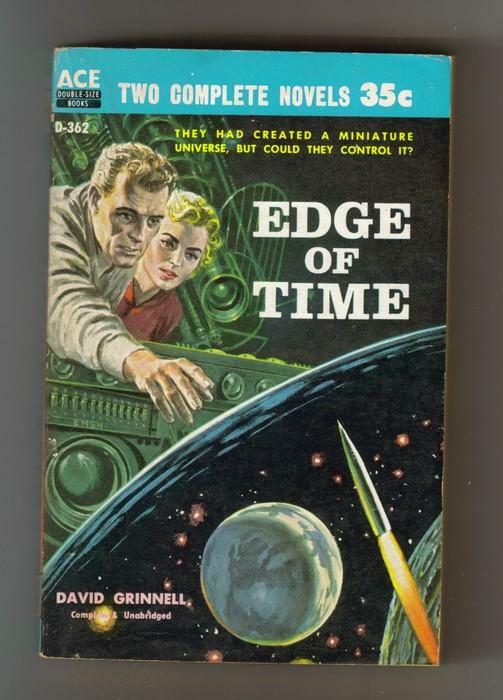 It is "The Edge of Time" (1959) by Donald A. Wollheim. Your description is nearly correct.